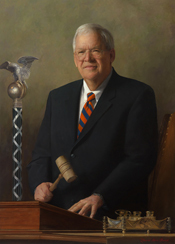 The only Speaker portrait to show elements of the House Chamber, Dennis Hastert’s portrait by Laurel Boeck was unveiled in 2009. Hastert posed in front of the Speaker’s chair on the rostrum, holding a gavel. 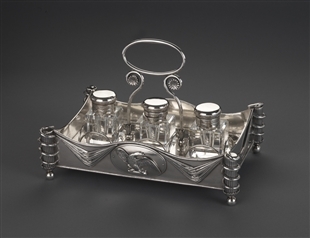 The silver inkstand, which has been associated with Chamber since it came to the House around 1820 and is set on the rostrum before the beginning of proceedings, is next to the Speaker’s left hand. Over his right shoulder is the House mace, present whenever the House is in session.